Teach your children about Crystal Geometry with this cool kit. Your Crystal Geometry kit comes complete with six cool mineral samples: muscovite, fluorite, calcite, citrine, pyrite and agate geode. 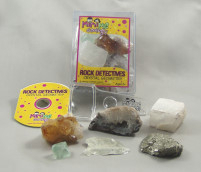 Also included in the kit is a hand magnifier and a CD with 30 pages of mineral information, sample identification activities, puzzles, coloring pages, and experiments. Adult supervision is required for some of the experiments.